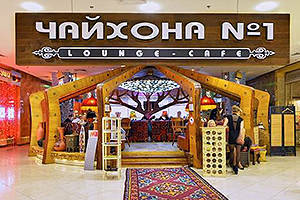 This page gives an overview of various casual dining restaurants that have been frequented by Muscovites for decades. 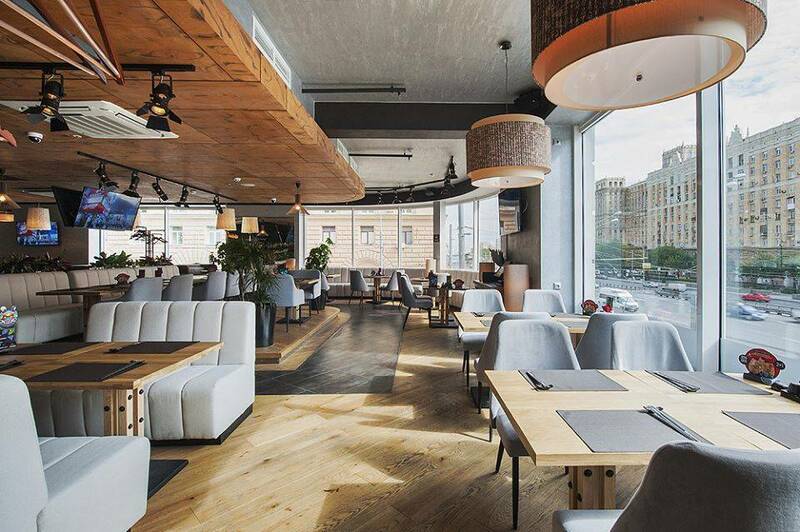 These include some of the largest chains that encompass nearly 400 restaurants in Moscow altogether, offering dinner at prices ranging from 800 RUB to 1,500 RUB. Lunch may cost significantly less, depending on the restaurant. Interestingly, the most affordable casual dining is offered by traditional cuisine restaurants, serving Ukrainian, Russian, Central Asian food, and dishes of the Caucasus. These restaurants tend to use local ingredients that are less expensive than imported produce, and offer tourists an authentic dining experience. Nearly all the centrally-located restaurants mentioned below provide menus in English. The prices quoted were correct at the time of writing, however please check with the restaurant for the latest pricing and menu options. 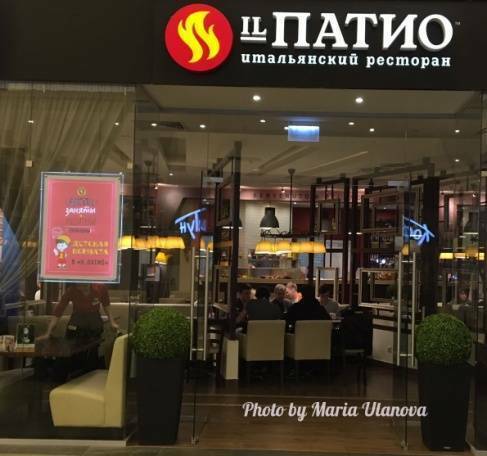 IL PatioRussian: Иль Патио owns the largest chain of Italian restaurants (over 70 locations) in Moscow. The restaurant closest to the Kremlin can be found at Bld. 2, 3A Kamergersky LaneRussian: Kamergerskiy pereulok or Камергерский переулок. The menu is traditional Italian food: pasta, pizza, salads and desserts. Other favourites, including Mediterranean meals are also featured, such as Caesar salad (350 RUB) or Greek salad (350 RUB). 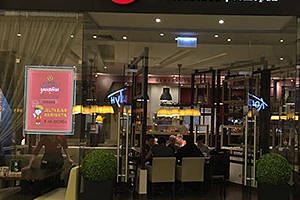 The menu offers 16 types of pizza, costing from 300 to 550 RUB. The interior is designed in soft pastel shades using natural materials, and Italian music can be heard throughout the restaurant. The average meal price (salad, pasta/pizza, dessert, coffee) is 1,000 RUB. An English menu is available. to recreate the atmosphere of French cafés: you can listen to French music, see chamber music performances (French accordion, singing, etc.) that are held on a regular basis, or even join an art workshop. The menu consists of mostly French cuisine. You can have traditional onion soup (290 RUB), escargots à la bourgignonne (530 RUB), confit duck leg (670 RUB), etc. for your lunch. A typical dinner (including salad, a main course, and coffee) will cost you 1,200 RUB. Lunch deals are offered in the afternoon (e.g. soup + salad + coffee for 480 RUB). A cup of coffee with a dessert will cost about 500 RUB. The restaurant provides an English menu. 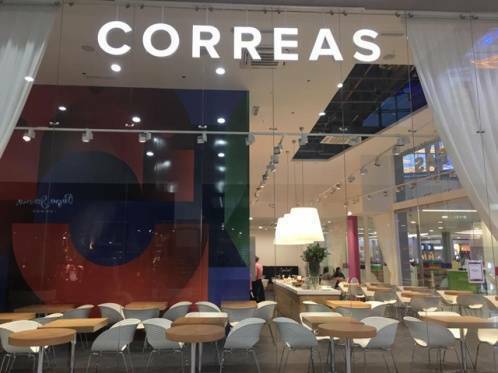 CorreasRussian: Корреас is a chain of Italian and European cuisine restaurants (7 locations in Moscow) in the mid-level price range. 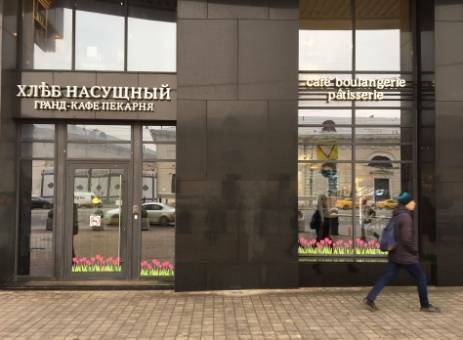 The restaurant closest to the Kremlin is located in Romanov DvorRussian: «Романов двор» business center at 4 Romanov LaneRussian: Romanov pereulok or Романов переулок. The menu includes salads, soups, sandwiches, pizza, main courses, desserts and beverages. You will pay 530 RUB for a classical Caesar salad and 380 RUB for a fresh tomato and cucumber salad. Chicken noodle soup costs 280 RUB, and pizza prices vary from 380 to 600 RUB depending on which of the nine types you pick. 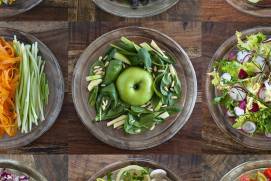 A typical dinner (including salad, pizza, dessert, and homemade lemonade) is 1,300 RUB. An English menu is available. lamb, chicken, salmon, British-style chicken pie, turkey pasta, chicken breast and potato gratin, etc. The lunch special gives you a vegetarian soup of the day or hummus for half price. The average price for lunch is 750 RUB, while an average full-course meal including salad, a main dish, dessert, and drink will cost you 1,500 RUB. A separate section of the menu is devoted to bruschettas (toasted bread with various toppings like salmon, fried eggplant, etc. ), priced between 320 and 485 RUB. Vegetarian food and quick-meals are also available. 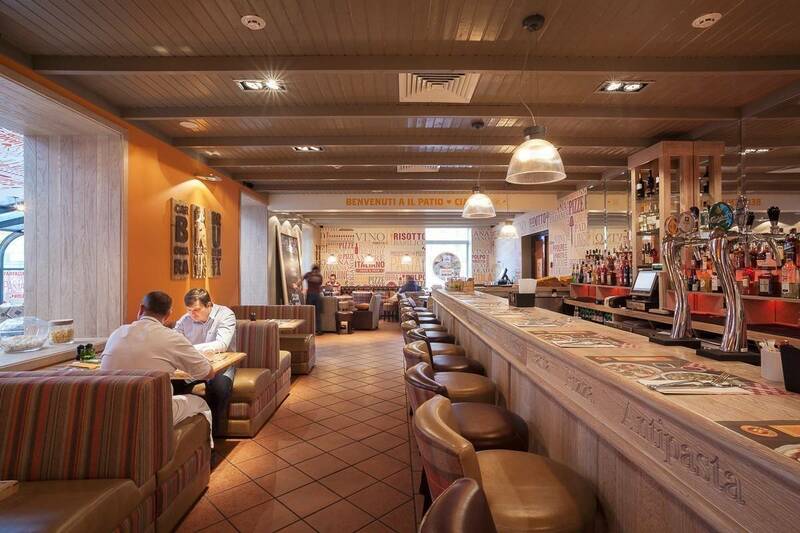 Aged wood is the signature style of Le Pain Quotidien. The restaurants feature rustic décor that gives the feeling of being surrounded by history. 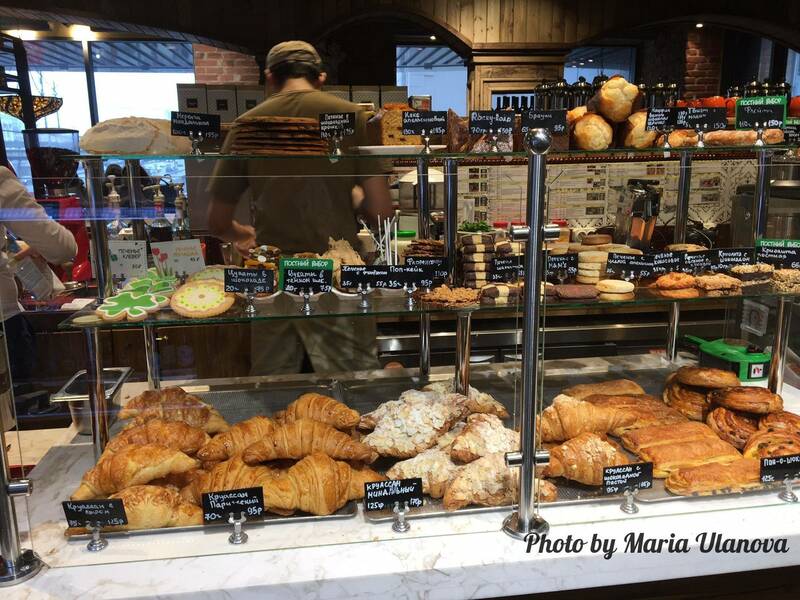 Each restaurant is also a bakery, offering breads and pastries for takeaway. Free Wi-Fi and an English menu are available. Even if you are in a beautiful historic area or a tidy park, walking around the huge city takes up a lot of energy. 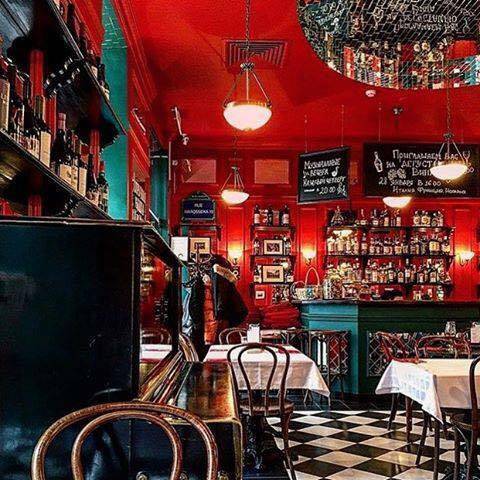 For you to have a rest in the best way, on the pages of our website there is a lot of information about the best restaurants, best bars in Moscow etc. 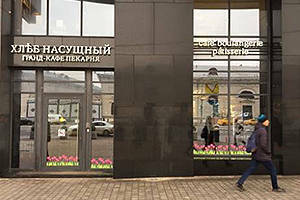 Korchma Taras BulbaRussian: Корчма «Тарас Бульба» is a chain of restaurants with a particular focus on Ukrainian cuisine (18 restaurants in the city). 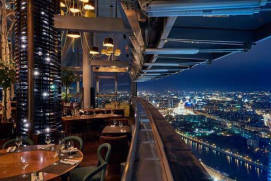 The central restaurant can be found at 8/1 Mokhovaya StRussian: ulitsa Mokhovaya or улица Моховая, close to the Kremlin. You can sample borsch, pirozhkia generic word for individual-sized baked or fried buns stuffed with a variety of fillings, pancakes, oladyismall thick pancakes or fritters common in Russian, Ukrainian and Belarusian cuisines, pelmenidumplings consisting of a filling wrapped in thin, unleavened dough and varenikidumplings that are filled with sweet or savory filling, homemade sausage, and other traditional Slavic dishes while sitting at traditional tables, surrounded by decorations and household items from South Russian and Ukrainian villages. The average price for dinner (traditional soup, pelmeni, pirozhki, and beverage) is 800 RUB. 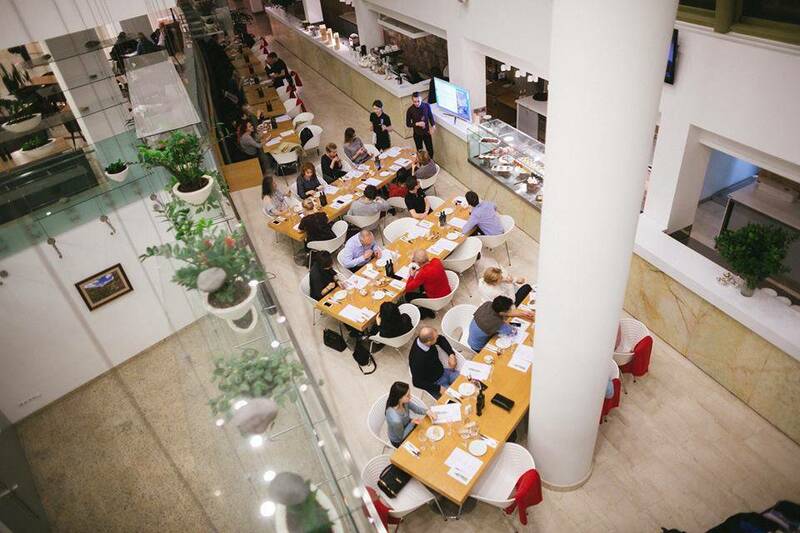 Two restaurants in the chain are open 24/7 (at 8/1 Mokhovaya St and 12 Smolensky BlvdRussian: Smolenskiy bul’var or Смоленский бульвар. An English menu is available. 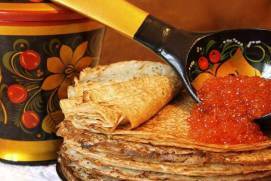 When Russians think of ‘cuisine of the Caucasus’, their first association is with Georgian cuisine. Located in the south, behind the Caucasus Mountains, Georgia was part of the former Soviet Union. 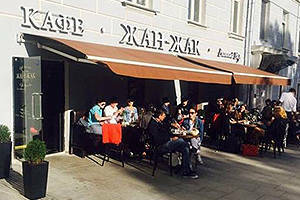 Georgian cuisine is revered and beloved in Russia: many generations of Russians and Soviets grew up on khachapuri, khinkalia dumpling made of twisted knobs of dough, stuffed with meat and spices, shashlika dish of skewered and grilled cubes of meat, lavasha soft, thin unleavened flatbread made in a tandoor, and Georgian wines. This type of cuisine is definitely worthy of tourists’ attention. 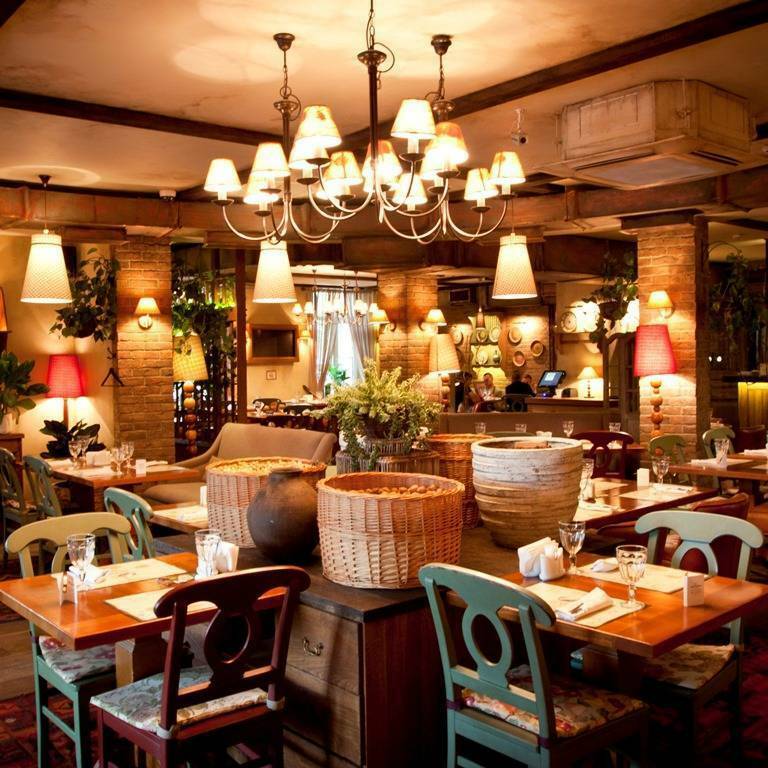 KhinkalnayaRussian: Хинкальная is a chain of Georgian restaurants (19 locations in Moscow), most of which can be found in the historical centre of the city. The menu is rich in unfamiliar meal names. For salads and cold starters, we would recommend satsiviGeorgian chicken with walnut sauce, a high-energy Georgian dish with a very complex recipe (400 RUB). Lobio (340 RUB), a Georgian dish prepared with beans and spices, is a classical hot starter. For soup, there is kharcho (beef soup with walnuts, rice and spices), at a price of 320 RUB. For meat options, khinkali is a good choice. Khinkali are sold individually and are quite large, so 3–5 dumplings will be enough for most people. As for bread, the famous Georgian khachapuri (flatbread filled with cheese, cheese and eggs, or spinach) is a must for 330–390 RUB. 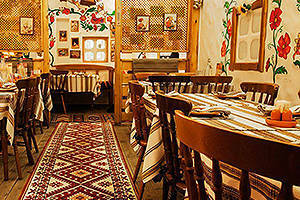 You will pay 1,200 RUB for a typical meal (satsivi, vegetable salad, meat main course + drink). If you’re on a budget, 5 khinkali dumplings, khachapuri adjaruli, and a drink for 800 RUB can be a good choice. No business lunch options are offered. A menu in English is available. 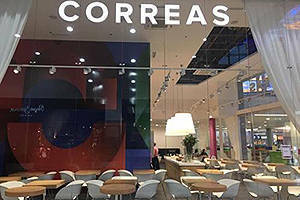 Jon JoliRussian: ДжонДжоли is a chain of Georgian cuisine restaurants run by the famous Ginza Project restaurant group (13 restaurants). 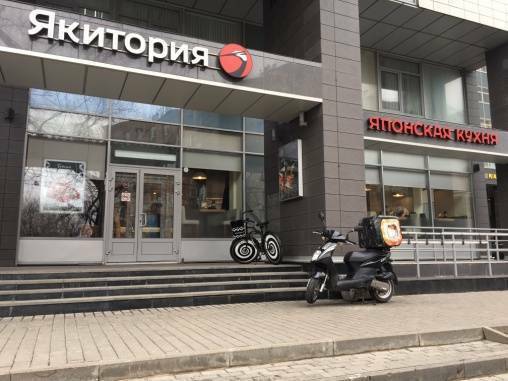 In the very heart of Moscow, you can find one at 20/1 Tverskaya StRussian: ulitsa Tverskaya or улица Тверская near PushkinskayaПушкинская metro station, entrance from Nastasyinsky LaneRussian: Nastasyinskiy pereulok or Настасьинский переулок. The Hot Starters section of the menu includes some favourites from Georgian cuisine: hot khachapuri (cheese-filled bread, 320–390 RUB), ajapsandali (vegetable ragout, 340 RUB), lobio (cooked red beans with spices, 210 RUB), etc. 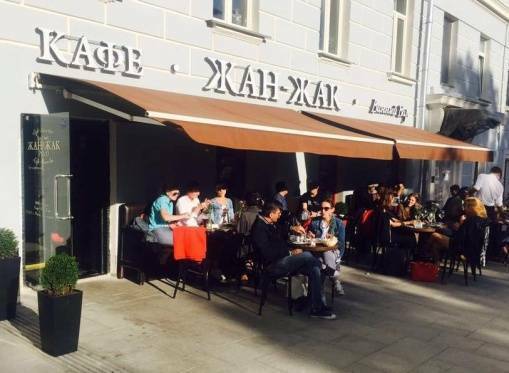 You can choose from eleven types of soup for your lunch, including traditional Georgian kharcho, dushbara, and khashlama as well as Ukrainian borsch and Asian lamian. 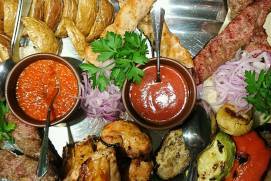 For the main course, you can try the famous Caucasian shashlik (of lamb, beef or chicken), the price of which varies from 450 to 740 RUB. A business lunch is offered from 12 pm to 4 pm (including vegetable salad, soup, and a main course), for 350–470 depending on the number of courses. 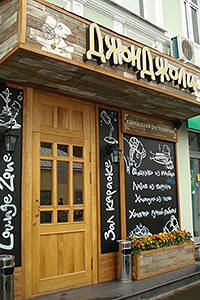 A typical dinner including entrée, vegetable salad, a main course, and drink will cost about 1,200 RUB. An English menu is available. 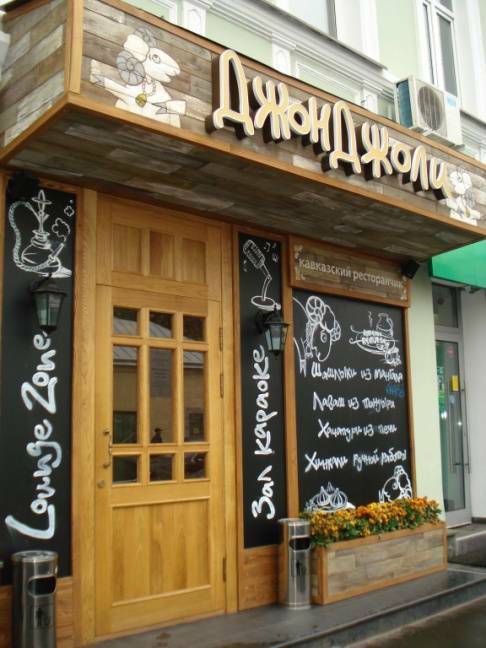 Chaikhona #1Russian: Чайхона №1 (47 restaurants) offers Uzbek, Pan-Asian, European and Russian cuisine. Lunch options feature typical hearty soups (chorbapotato soup with meat, chuchvaramade of unleavened dough squares filled with meat, etc.) and hot main courses including grilled and woodfire food. Pilaf (a rice based dish with meat, onions and carrots) is the hallmark of Uzbek cuisine. Meanwhile, the restaurant also offers pizza, kids and Japanese menus. This is a lounge café concept with subdued music and hookahs throughout, so the restaurants fill up with young people in the evening. A typical dinner (vegetable salad, pilaf, dessert, tea) will cost you 1,300 RUB. 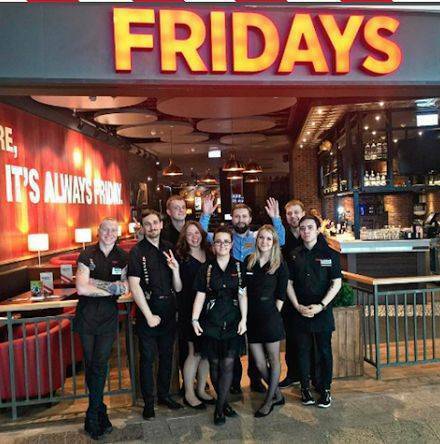 TGI Fridays is an international chain of American cuisine restaurants (15 locations in Moscow) that has thrived in the city since 1998. 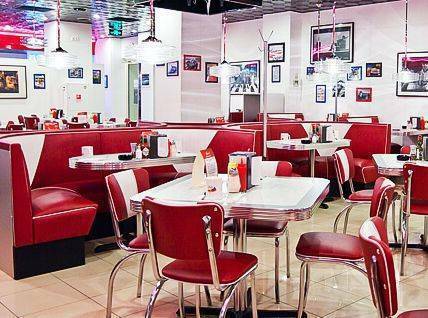 You can enjoy American style meals in a relaxed atmosphere, including chicken wings (400–430 RUB), salads (vegetable salad for 300 RUB, meat salads for 425 RUB), and burgers priced between 400 and 760 RUB. The menu also includes grilled food, desserts and various cocktails. For a typical meal from the main menu (for example, salad, chicken wings, quesadilla, and coffee), you will pay 1,300 RUB. A business lunch option is offered until 4 pm (including soup, salad, a main course, and drink) for the price of 400 RUB. An English menu is available. 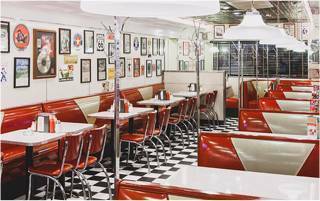 Starlite Diner is another chain of American cuisine restaurants. 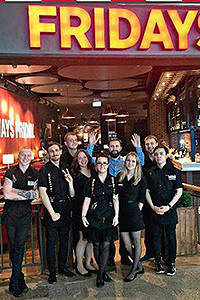 These are classical style ‘diners’ with prompt service. The most central location is 8a Strastnoy BlvdRussian: Strastnoy bul’var or Страстной бульвар, close to Pushkinskaya metro station. The menu offers soups, salads, burgers, sandwiches, flatbread, desserts, etc. The interior is shaped by bright red sofas, chairs, and white tables. The walls are decorated with vintage ads for Coca Cola, American cars and other national symbols. Despite the modest interior, the menu can be quite expensive. 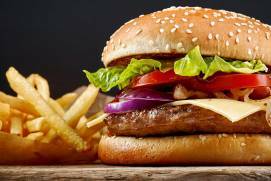 You will pay 500–725 RUB for a burger (one of 17 types) depending on the filling, 275–665 RUB for a salad, and 280–370 RUB for a dessert (a slice of cake). 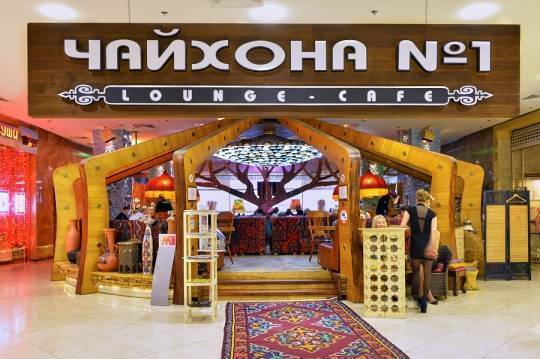 The restaurant also serves some national Russian food: borsch (300 RUB), chicken noodles (290 RUB), and pelmeni (330 RUB). A typical lunch (a salad, burger, and drink) will cost you 1,200 RUB. An English menu is available. The restaurants are open 24/7. 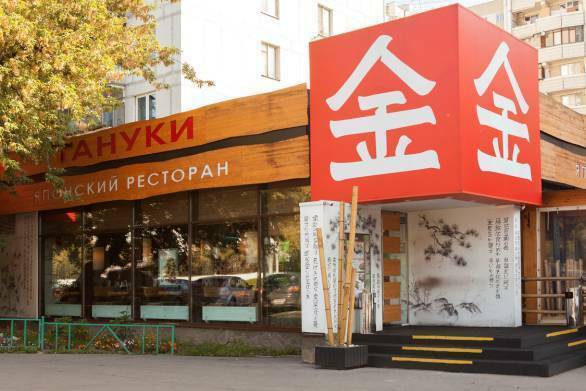 The largest chain of budget-friendly Japanese cuisine is called Tanuki Russian: Тануки(55 restaurants in the city). 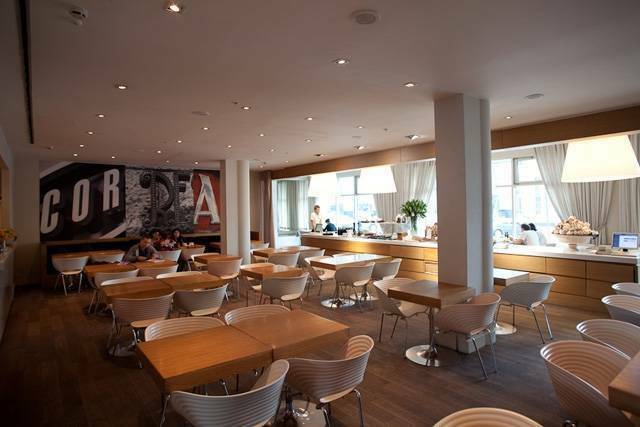 These restaurants can be found both in the city centre and residential neighbourhoods. The interior is rich in Japanese decorations, statuettes and rice paper lamps—everything that should remind visitors of Japan. The menu consists of traditional Japanese sushi, sashimi and rolls, but other options like gyuniku burgers (Japanese mini burgers with ham), tiramisu, and others are available, too. The kids menu offers burgers and mini skewers, French fries, and muffins. There is a choice of 13 soups with meat, chicken, fish, noodles, ginger, seaweed, coconut milk, etc., with prices ranging from 260 to 360 RUB. You will find an abundance of seafood options here, including octopus skewers, and mussels in sauce. The main courses include fried rice with chicken or vegetables (210 RUB) or meat (310 RUB), beef fillet medallions (850 RUB), among others. Rolls (6 pcs.) cost between 280 and 395 RUB. The price of a typical dinner (including a hot starter, roll, vegetable salad, and drink) is 1,000 RUB. 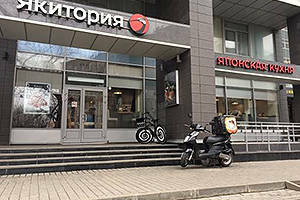 YakitoriaRussian: Якитория is also a large restaurant chain (46 locations in Moscow) established in 1999. 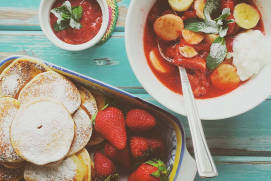 Apart from Japanese food, you can try national dishes from other countries, including the USA, Mexico, Italy, and Thailand. You can purchase burgers (380–420 RUB), burritos (500–520 RUB) and pizzas (470–530 RUB), all at the one place. The kids menu offers rolls, skewers and burgers. Soups cost between 270 to 370 RUB. You will find no meat soups on the menu, but there is a great variety of seafood and fish soups. Rolls will cost you between 200 and 420 RUB depending on the filling. A typical dinner price (including hot starter, roll, vegetable salad, and a drink) is 1,100 RUB. An English menu is provided. 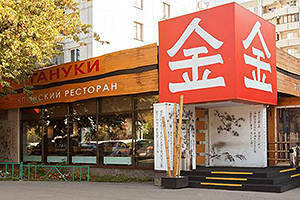 Planet SushiRussian: Планета Суши is the third largest Japanese cuisine restaurant chain (39 restaurants). 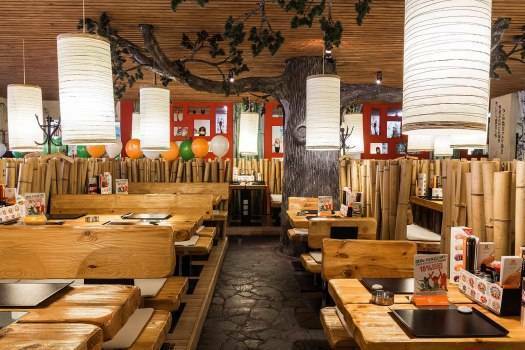 Rolls, salads, noodles, rice, and quick-meals are served here in a Japanese style, minimalist interior. Only Japanese soups are offered, but you will also find Caesar salads and other familiar dishes (interestingly, Caesar Salad is on the menu of most Japanese restaurants in Moscow). A typical meal (including hot starter, roll, vegetable salad, and drink) will cost you 1,100 RUB. 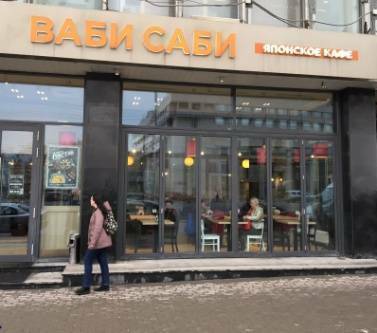 Other well-known restaurant chains include Wabi SabiRussian: Ваби Саби (19 locations; Japanese, Chinese and Pan-Asian cuisine), NiiyamaRussian: Нияма (19 locations), and Dve PalochkiRussian: Две Палочки (6 restaurants; a blend of Japanese, Italian, American and Pan-Asian cuisines). VietCafeRussian: ВьетКафе. 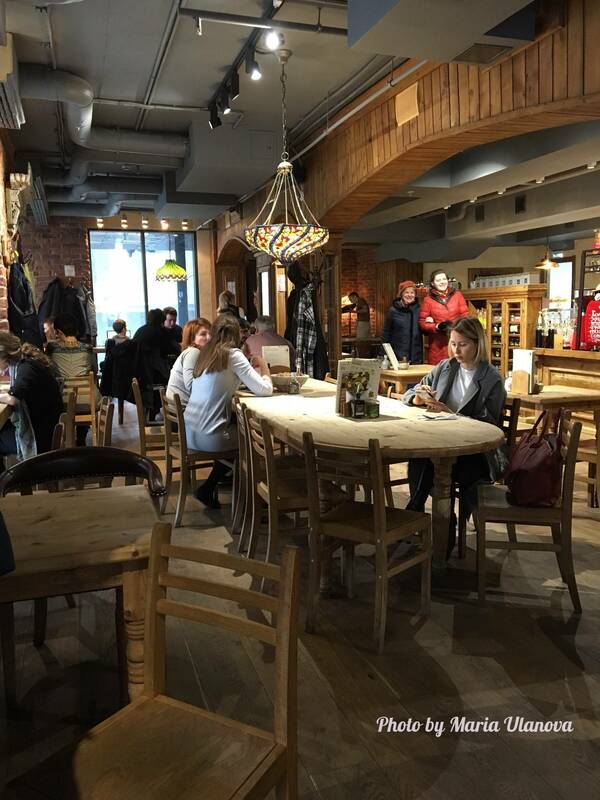 The first café in this chain opened in Moscow in 2006. You can still visit it today at 3 Gazetny LaneRussian: Gazetny pereulok or Газетный переулок, in the very heart of the city. The chain serves exclusively Vietnamese food. 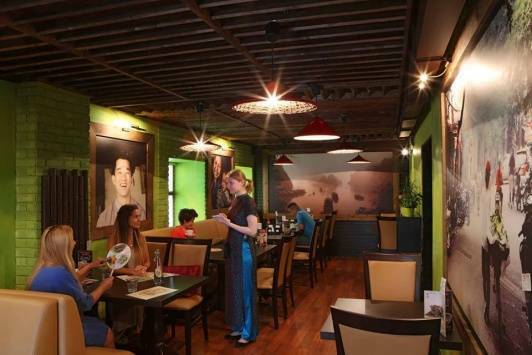 The recent boom in Pan-Asian tourism has bolstered the growth of the chain, which offers authentic Vietnamese cuisine. The chain has 11 cafés today, which offer the famous Vietnamese rice paper rolls (nem rán) with various fillings (330–390 RUB), steamed rice noodle rolls bánh cuốn (320–380 RUB), steamed rice buns (70–90 RUB per piece), salads (380–490 RUB), and meat and chicken (330–590 RUB). 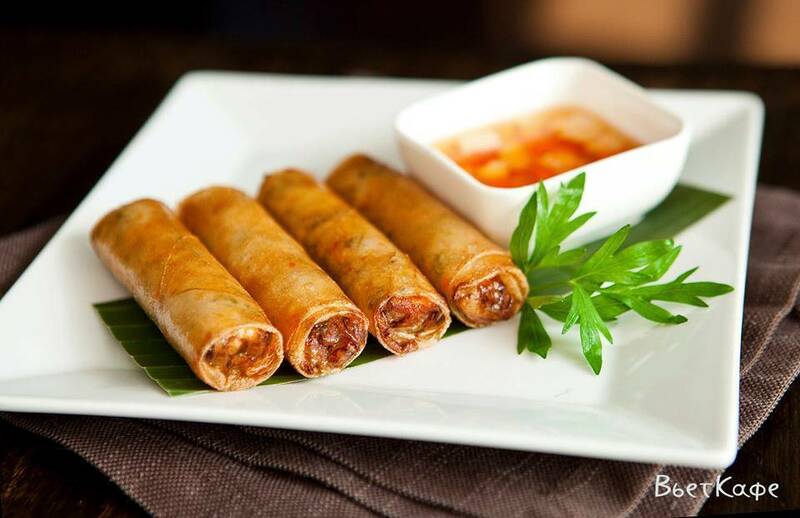 A set of the most popular Vietnamese dishes—pho bo beef and rice noodle soup, Vietnamese rice paper rolls (nem a or bánh cuốn chay), and a drink (we recommend trying Vietnamese coffee)—costs 670 RUB. The price of a typical meal, when ordering courses individually, is 1,100 RUB. Jumping in for a cup of coffee with dessert will cost you around 500 RUB.